This blog post is part ofÂ World Blog Surf DayÂ – where 24 bloggers not living in their native country around the world writes about the experience of living in a different country. At the end of my post you will find a link to the next blog in the circle. Prague has a big (huge?) expat community of people from all over the world but Europe and US in particular. Whatever brought these people here in the first place most start out from scratch with building a social circle so it’s been easy for me to make new friends. As a Dane I’m use to communicating in English whenever I’m not dealing with Danes because Danish is a terrible language to learn and we’re a small nation. When I came here in the first place I had little intention of learning the Czech language because of my short stay and because it sounded as complex as Danish to grasp. As I realized that my stay would last more than 6 months I started thinking and talking about taking Czech lessons – but it stayed that way. There was too little incentive, too many other interesting things to do and I was too lazy. The Czechs are usually not that good at English unless they have a degree or have been abroad. Â So with almost all my friends being foreigners and no language to communicate with regular Czech’s it feels to me like I live in this parallel society of Prague. In this parallel are we that work in companies where the language is English, our friends are English and the media we follow are English. I have realized that whenever I return to Prague from being abroad (usually from counties where I speak the language) the first think that strikes me that I am back in my parallel world of not speaking the local language. The prices for food and beer are very reasonable compared to most places in Europe, it still puts a smile on my face when I can go to for a meal in a restaurant and have a beer or two and a meal for less than 6 Euros. I doubt that many of the people I hang out with today will be in Prague in a year. In a way it’s sad to think about but on the other hand it’s a nice reminder to enjoy the people and the place every day – it’s not going to last forever. Some people go to Prague for a couple of months, some for a couple of years. The next blogger in theÂ World Blog Surf DayÂ moved to Prague from USA to be with her Czech husband and start a new life in The Old World. I wish Sher the very best of luck in her adventure and hope you, the reader, will read Sher’sÂ Living as an American in the Czech RepublicÂ and the others stories. 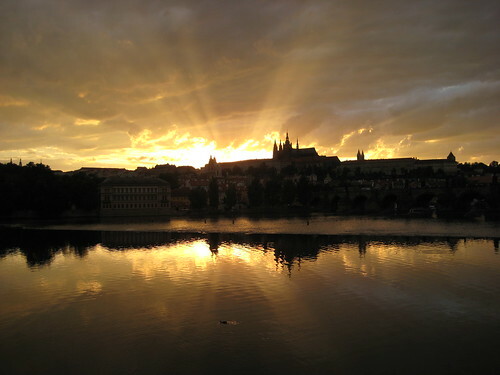 This entry was posted in Blogging, Living in Prague and tagged Blogging, danish, expat, living, meme, Prague, world by michael. Bookmark the permalink.